Wander over to Wildebeest Watch! Can’t get enough of these gnarly gnus? Head on over to our new spinoff project, Wildebeest Watch! In collaboration with Dr Andrew Berdhal from the Santa Fe Institute, and Dr Allison Shaw at the University of Minnesota, we are taking a closer look at what the wildebeest are doing in the Snapshot Serengeti images to try and better understand the details of the world’s largest mammal migration. Every year, 1.3 million wildebeest chase the rain and fresh grass growth down from the northern edge of the ecosystem down to the short grass plains in the southeast. We have a broad-scale understanding of where they are moving across the landscape, but don’t understand how they make these detailed decisions of where and when to move on a moment-to-moment basis. Wildebeest as individuals aren’t known for being particularly smart — so we want to know how they use the “wisdom of the crowd” to make herd-level decisions that get them where they need to go. 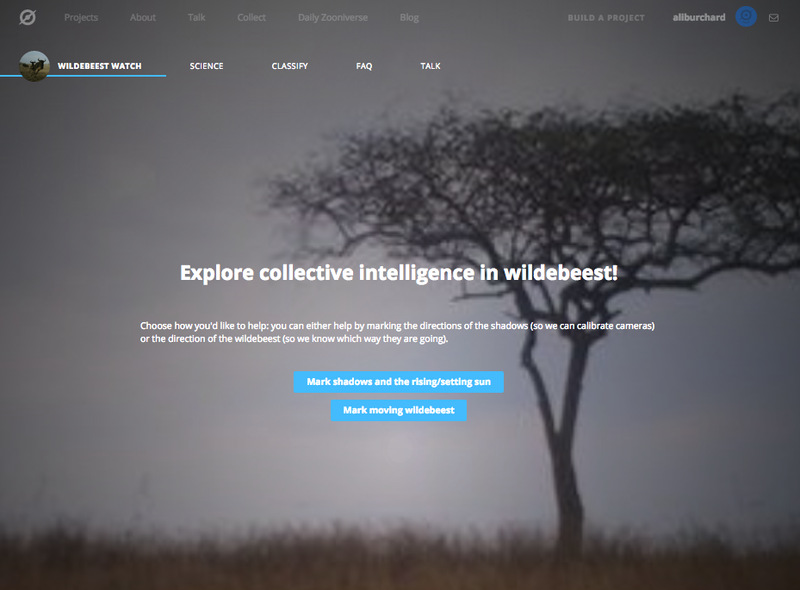 So while you’re waiting for more photos of lions, hyenas, and other sharp-toothed beasts, why not wander over to Wildebeest Watch to help us understand the collective social behavior of these countless critters? It’s pretty catchy, not just because it’s ridiculous, but because it’s a pretty good question. I mean, how many of you out there have actually ever heard a fox? The sounds of the bush are one of the many, many things I miss being back here in civilization. From my slightly sketchy corner of Saint Paul, I hear fire crackers and unmuffled engines roaring. Occasionally I get chattered at by an angry squirrel in the back yard. But that’s about it. Nothing like the otherworldly chorus of the Serengeti savanna that Lucy so beautifully described. The sounds really are incredible and often unbelievable, and I thought I’d share some of them with you. I couldn’t actually figure out how to upload audio files, so I scoured Youtube for the best audio clips I could find and embedded them as videos here. Zebras: Nothing like horses, these stripy equids sound something like a braying donkey crossed with a barking dog. Wildebeest: I believe that somewhere in the annals of Zooniverse blogs, there is an audio or video clip of me doing a wildebeest impression. This is better. Hyenas: Despite being hell-bent on devouring all of my camera traps, these guys are pretty cool. They have a rather large repertoire of very…unusual…vocalizations that are used to communicate in a number of situations. The whoop, which you hear at 0:05 and 0:55, is a long-distance call often used to rally scattered clan members. The laugh at 2:33 is a sign of nervousness or submission. Similar to human voices, hyena vocalizations are individually recognizable to clan-mates. 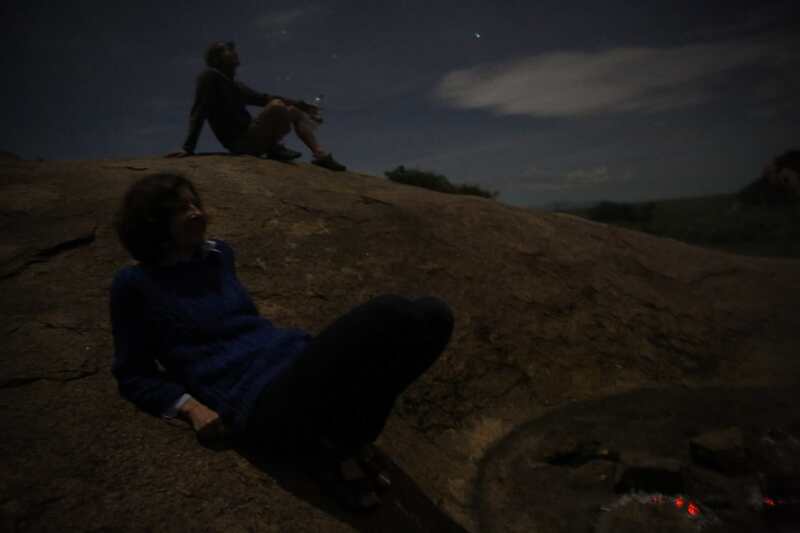 To learn more about hyena vocalizations, check out this blog by hyena expert and director of Masai Mara’s long-term hyena project, Kay Holekamp. Lions: And finally, for the best, non-hollywood lion roar, scroll about halfway down through our lion research center’s page. This is what they really sound like. I’ll take any of these noises over the sounds of the city any day. The rains have been especially good this year. 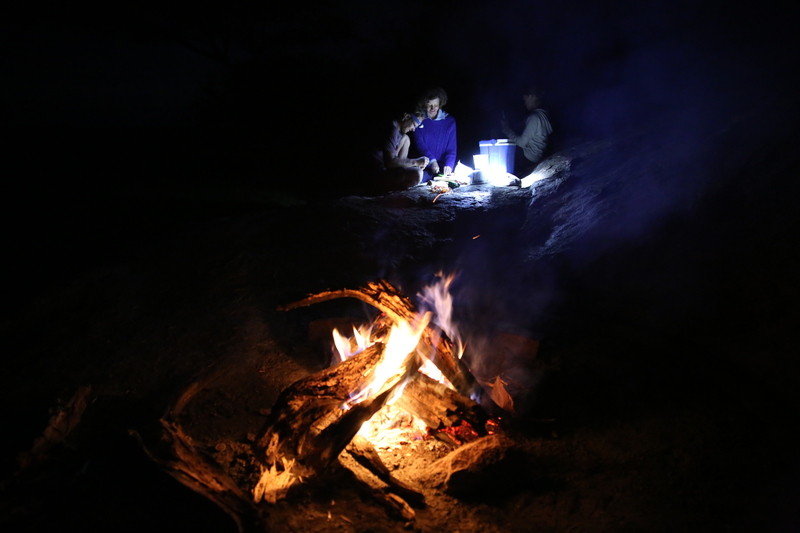 We are camping at Barafu Kopjes, at the eastern edge of the lion study area. The wildebeest have moved very far east, as I type this, I can hear them grunting loudly. The noise will only reach greater volume in the coming weeks as the rut approaches. The grass is green, the sky is full of rain clouds, and this is really the most glorious time to be in the Serengeti. Back within the camera trap grid, the grass is getting tall, and Ali has to mow it every time she checks the cameras. There is almost nothing for the lions to eat inside the grid; most of the lions have moved very far to the south and east. This is the happiest time of year for the wildebeest, zebra, and gazelle – they are out on the open plains where they can see any danger approaching. They can easily move off away from a hyena, a lion, and still be in the lush green grass –so short it’s like the fairway of a golf course. For the lions, though, having to shift so far outside of their usual territories, this is a time of uncertainty. They may encounter rivals, unwelcoming territory holders, and so they move quietly across the land, always on edge. Further to the east, across the park boundary, into the Ngorongoro Conservation Area, there is also the danger that our study lions may encounter the Masaai warriors. Several years ago we lost three of our study lions in a wet April like this one. All the grazers are drawn eastwards by the extraordinary richness of the volcanic soils immediately downwind from the Ngorongoro highlands. Without the wildebeest, the grass would be nearly as tall here as anywhere else, but it is so sweet, that it is mowed right down to the ground. The vistas here are breathtaking; every animal looks as though it’s floating in green space. It’s almost like snorkeling – the bright orange of the gazelle from head to toe, the vivid black and white stripes of the zebra, the dull brown of the wildebeest but in such mass it’s like a living train as the herd flows across the landscape. And lions, when we see them, stand out a mile. Usually they look like the bulls-eye – a large green target with a concentric circle of brown wildebeest around them. This is the wet season. Ali with sausages. Lots of sausages. 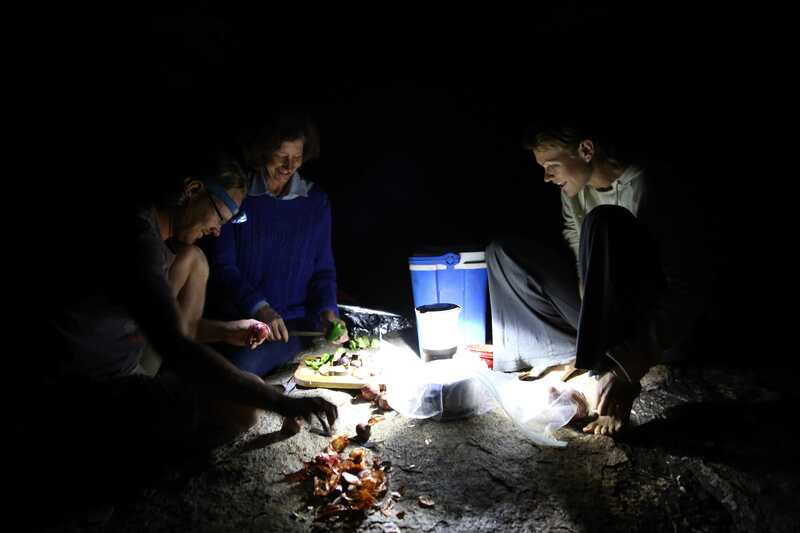 Susan, Daniel, and Ali, preparing a feast. Wouldn’t be camping without a campfire. Rumor has it that a hard drive just arrived from Tanzania in the Ecology building at the University of Minnesota. If you’ve spent time on Snapshot Serengeti, then you’ll know that wildebeest are rather abundant in the Serengeti – especially during the rainy season. But it wasn’t always this way. In the 1950’s there were fewer than a quarter of the wildebeest there are today. Back then, there was something suppressing the wildebeest population, keeping it much lower than the land’s capacity. It wasn’t predators, though there are now more lions and hyena in the Serengeti thanks to the increase in wildebeest. It wasn’t poaching, though we know that poachers take a substantial number of wildebeest. It was disease. In the early 1930’s rinderpest was detected in Serengeti’s wildebeest. Rinderpest is closely related to measles. In fact, it is believed that measles evolved from rinderpest some 800 to 1,600 years ago. But rinderpest doesn’t affect people; instead, it affects ungulates and most likely evolved in Eurasia. For a long time, the Sahara Desert probably acted as a sort of barrier, preventing the disease from reaching sub-Saharan Africa. But in the late nineteenth century, people transported infected cattle into the region. Rinderpest has high mortality in wildebeest, especially in young animals. What was once known as “yearling disease” killed so many young wildebeest that the Serengeti population was only about 300,000 animals in the 1950’s. Rinderpest also causes high mortality in cattle, and so inoculation attempts started in the 1940’s. These got better over time, and in the 1960’s there was a largely successful push to vaccinate 80 million cattle across twenty-two African countries, including Tanzania. Wildebeest themselves were not vaccinated, but as the number of rinderpest-infected cattle decreased with vaccination, so did the number of wildebeest that had rinderpest. Following the initial vaccination push, regular vaccination campaigns kept the infection rate very low in cattle. Despite a handful of small localized rinderpest outbreaks in the ensuing decades, the disease was essentially eliminated from the Serengeti wildebeest population. This pattern of infection shows us that for rinderpest, wildebeest are what is termed a spillover species, which means that the wildebeest population cannot by itself sustain the disease; wildebeest must constantly contract the disease from cattle for it to survive in the wildebeest population. The Serengeti wildebeest population has since exploded. No longer constrained by rinderpest, it has soared to 1.2 to 1.5 million animals. As for rinderpest, the vaccination campaigns of the mid twentieth century were only a start. The international Food and Agriculture Organization (FAO) continued to pursue the disease by vaccinating cattle and by the 1990’s had reduced it to only local outbreaks worldwide. In 2010, the FAO declared that they were confident that they had eliminated the disease from everywhere it had been known. And less than two years ago rinderpest was declared officially eradicated. It is the second of only two diseases that humanity has successfully eradicated, the first being smallpox. Maybe it won’t surprise you that Season 4 covered 2012’s wet season, when over a million wildebeest, zebra, and Thomson’s gazelle migrate through our study area. I find it interesting that hartebeest are also pretty numerous, but I wonder if it’s because of that one hartebeest that stood in front of the camera for hours on end. This pie chart is based on the number of what we call “capture events,” which is the set of 1 or 3 pictures you see every time you make a classification. Once a camera has taken a set of pictures, we delay it from triggering again for about a minute. That way we don’t fill up the camera’s memory card with too many repeats of the same animals before we have a chance to replace them. But a minute isn’t a very long time for an animal that has decided to camp out in front of a camera, and so we frequently get sequences of many capture events that are all of the same animal. One of the things we’ll have to do in turning your classifications into valid research results is to figure out how to find these sequences in the data automatically. If you’re interested in how I made the above pie chart, keep reading. But we’re going to get technical here, so if algorithms don’t interest you, feel free to stop. We’ve recently been working on a grant proposal to continue our camera trap project past 2012. Grant proposal time is always a little bit hectic, and particularly so this time for Ali, who, while running around Arusha to get research permits and supplies and get equipment fixed, has also been ducking into Internet cafes to help with the proposal. This proposal is going to the National Science Foundation, which has funded the bulk of the long-term Lion Project, as well as the first three years of the camera trap survey. The proposal system is two-tiered. First we submit what is called a “pre-proposal” – a relatively short account of what we want to study and why, along with researchers’ credentials. This is the proposal that’s due today. Over the next six months, NSF will convene a panel to review all the pre-proposals that it receives and will select a fraction of them to invite for a “full proposal” due in August. If we get selected, we will then have to write up a more extensive proposal, describing not only what and why we want to do this research, but also exactly how we’re going to do it and how much money we require. Then another panel is convened to review these proposals, with the results reported in November or December. Proposals are always helped by “preliminary data” – that is, data that’s not yet ready for publication, but gives a hint at a research study’s power. 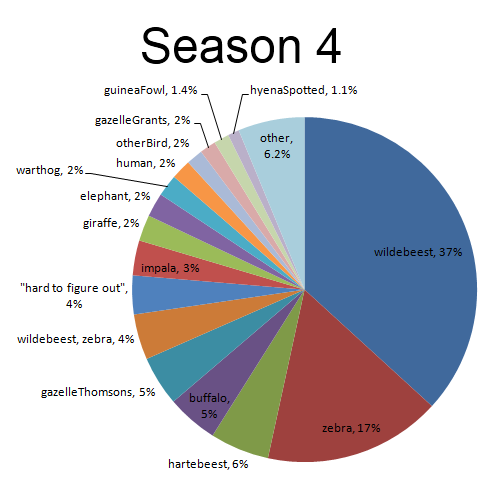 So we’ve taken the Snapshot Serengeti classifications for Seasons 1-4, run a quick-and-dirty algorithm to pull out images of wildebeest and hartebeest, and then stuck the results on maps, grouped by month. 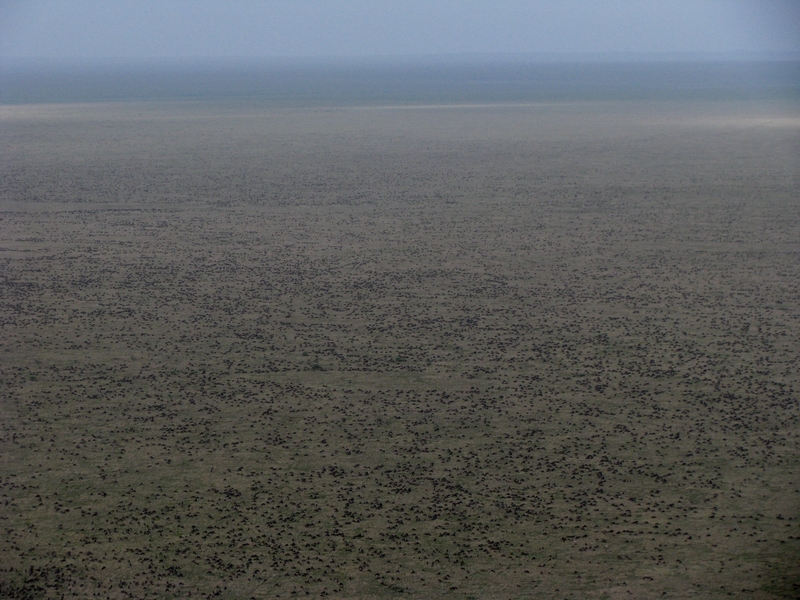 The size of the circles shows how many wildebeest or hartebeest were seen that month by a camera. The background colors show ground vegetation derived from satellite images, so green means, well, the vegetation is green, whereas yellow means less green vegetation, and tan means very little green vegetation. 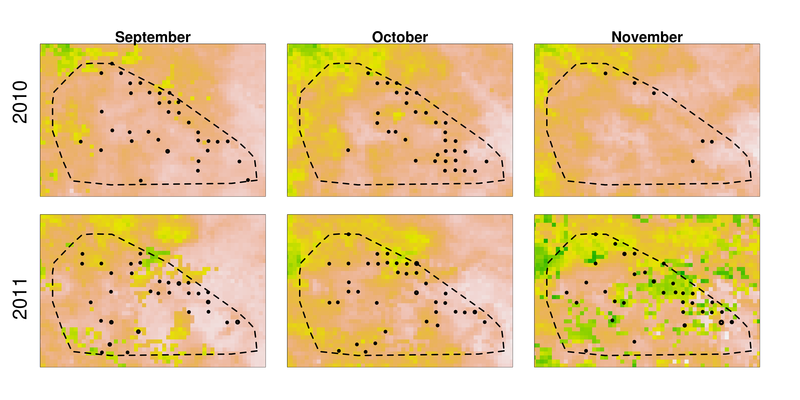 These maps show variation from month to month and season to season in the greenness of the vegetation and the response of the grazers to that vegetation. They also show that these patterns vary from year to year. 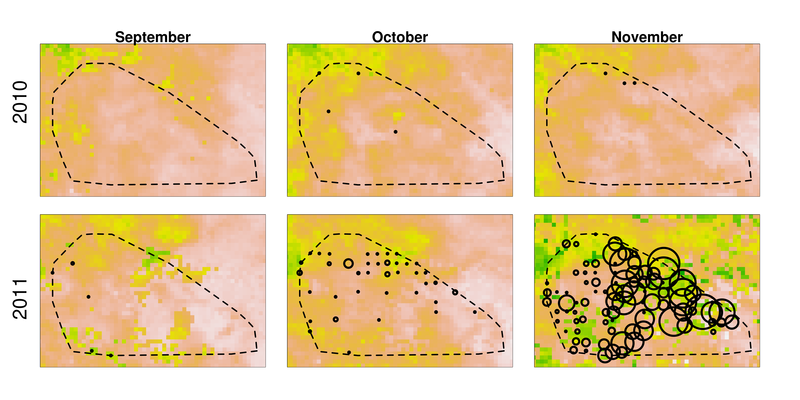 We’ve used this variation as a foundation to our proposal: how do these different patterns in vegetation that vary over time affect the grazers in the Serengeti? How do the variations in grazers affect the predators? What questions spring to your mind when you look at these maps?